Thirty-one years ago a crisis with Iran crushed then-President Jimmy Carter’s re-election chances. President Barack Obama faces the same prospect, but this time the potential consequences are far more serious. On November 4, 1979, Iranian students seized 52 diplomats and the American embassy in Tehran. Months later Carter ordered a helicopter rescue of those captives that ended disastrously and that played a major role in his 1980 re-election defeat. Carter’s pollster, Pat Caddell, told the President that he lost the election because he had failed to secure the release of the U.S. hostages. Like Carter, Obama’s political future and American security interests are at stake in a new duel with the radical Islamic Republic of Iran. Obama’s challenge is to stop the Iranian regime from acquiring atomic weapons. So far, his efforts are failing, and time is running out. Iran is enriching uranium that could be used for an atomic weapon. A September 2010 International Atomic Energy Agency (IAEA) report states Iran has now enriched enough uranium for two nuclear weapons (if further enriched to 90%). Also, in April 2010, Iran unveiled a new generation of centrifuges that reportedly could allow it to enrich uranium at a rate five times faster than its existing 8,800 centrifuges. Iran is hiding new enrichment facilities as well. Last year Obama revealed a secret uranium enrichment site on an Iranian Revolutionary Guard base near Qom. Obama said the “configuration” of the Qom facility is “not consistent with a peaceful nuclear program.” Recently both Israeli intelligence and the People’s Mojahedin Organization of Iran, an exiled opposition group, asserted that Iran is building more undeclared nuclear sites. Iran has the technology to build a bomb. The IAEA states, “Iran has sufficient information to be able to design and produce a workable implosion nuclear device (an atomic bomb).” It also reported finding Iranian technical documents on the adaptation of missiles to carry nuclear warheads and on underground nuclear test silos. Tehran has a credible nuclear-capable ballistic missile arsenal. It has the Shahab-3 and the North Korean-supplied nuclear-capable BM-25 missile, which puts large portions of the Middle East and Southeastern Europe within range. 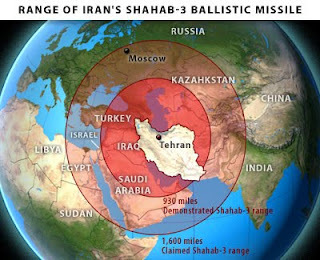 A 2005 Wall Street Journal report indicated that U.S. intelligence believes that Iran is working to adapt the Shahab-3 to deliver a nuclear warhead. The potential consequences of an Iranian atomic arsenal are serious. Iran has sufficient conventional weapons capable of striking U.S. forces throughout the Middle East, and atomic weapons in their hands would raise that threat to an unacceptable level. An atomic-armed Iran would likely spark a nuclear arms race, destabilize the region, and create economic turbulence in global energy markets. There is already a mad rush among Persian Gulf countries to build up their arsenals, as seen in Saudi Arabia’s proposed $60 billion weapons-buying spree to counter the Iranian threat, so energy markets are understandably jittery. Iran’s ideologically aggressive foreign policy backed by nuclear weapons must be taken seriously. Iranian President Mahmoud Ahmadinejad famously declared that Israel should “be wiped from the map,” a threat soberly entertained in Jerusalem and reinforced last week. On November 3, Reza Kahili, the pseudonym of a former CIA operative who infiltrated the Iranian Revolutionary Guard, told Israel National News that Iran would not hesitate to use nuclear weapons against Israel. He also said that Iran would use atomic weapons against the Persian Gulf countries and Europe to bring about the “last hadith,” which calls for total chaos, necessary in order for Imam Mahdi, the Shia messiah, to appear. The State Department’s 2010 report on international terrorism states that Iran “remained the most active state sponsor of terrorism” in 2009. That finding explains the widespread concern that Iran might share its nuclear weapons technology with extremist groups like Hezbollah and with rogue state leaders like Venezuela’s Hugo Chavez. Chavez has a close relationship with Tehran and just returned from Russia, where he signed a deal for two 1,200-megawatt nuclear power reactors. There is a growing international consensus to pressure Iran to fully disclose its nuclear activities. That effort started in 2003, but Iran has repeatedly failed to live up to its obligations. In 2006 President George Bush offered to join talks with Iran if it would suspend uranium enrichment. That gesture led to the creation of the so-called “Permanent Five Plus 1” (U.S., Russia, China, France, Britain and Germany), which offered Iran a package of incentives for cooperation. But Iran failed to respond, which led to the first of four United Nations sanctions resolutions. In 2009 Obama said he wanted to try a “different approach.” He sought direct engagement with Iran while downplaying military action and insisted that the U.S. did not seek to change Iran’s regime. Once again, Iran failed to respond, causing Obama to seek another round of UN sanctions. UN Resolution 1929 imposed the toughest sanctions yet, and during the summer of 2010 the U.S. and its allies added to those sanctions, but nations like China continued a robust relationship with Iran, which eased the sanctions’ impact. Now Obama wants to negotiate with Iran to see whether sanctions are affecting the regime’s nuclear policy. That meeting should take place November 10. Of course Ahmadinejad is willing to talk, but only until Iran has an atomic arsenal. Then Obama will have only two options: he can strike militarily and accept the consequences, or he can accept a nuclear-armed Iran. An air campaign will set back the regime’s atomic program a few years and requires support for Iranian opposition groups with the clear goal of regime change. A ground war is virtually ruled out because of other operations. It appears that Obama will choose a failing Carter-esque approach that accepts a nuclear-armed Iran and a doomed containment policy of mutual defense treaties. But with its national survival in the balance, Israel will have no choice but to take unilateral military action against Iran, which will create a region-wide firestorm.